"I found myself 300 feet deep under the ground, where I wandered deeper and deeper, until I was under the bed of the ocean and ships sailed over our heads." It's maybe the most frightening conception that humans can imagine - suddenly the ground where we pass our daily live trembles and fell apart -an earthquake! 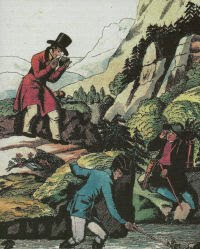 The doctor, pastor and naturalist William Stukeley visited in 1756 the coal mine of "Sir James Lowther" to explore the underground of Whitehaven (England) and study the place were earthquakes were born. 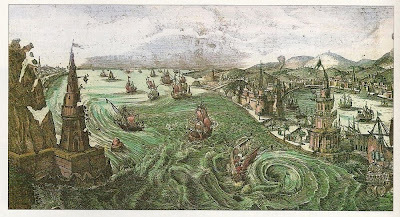 In the 18th century research of this kind urged, to the people it seemed that they live in a particular earthquake shattered world: in 1692 Port Royal on Jamaica, in 1693 Catania in Sicily, 1726 Palermo, 1746 Lima, 1750 London and in 1755 the terrifying earthquake in Lisbon. Fig.1. 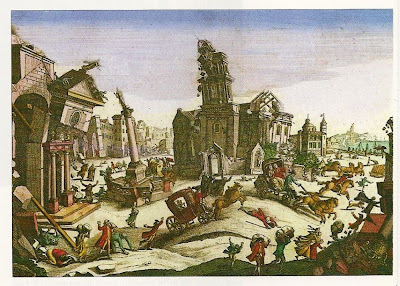 Contemporary depiction of the earthquake in Reggio Calabria (Italy) in 1783 (Trustees of the British Museum, London). Fig.2. The earthquakes causes a Tsunami in the harbor. During these times the predominant explanations for earthquakes were underground explosions, caused by mixing of chemicals, forming a kind of gun powder, or exhaling gases. These hypothesis seemed supported by some observation, Christian Staqueler, consul of the German city of Hamburg, and eyewitness of the great earthquake that destroyed Lisbon tell´s: "First we heard a rumble, like the noise of a carriage, it became louder and louder, until it was as loud as the loudest noise of a gun, immediately after that we felt the first tremble." The reference to a "gun" implies the association to some sort of explosion. "How to make artificial earthquakes. Take 20 pounds of iron filings, just add the same amount of pounds of sulphur. You knead the whole adding some water, to obtain a half wet and half dry dough. Bury it 3 to 4 foot deep under the earth. After 6 or 7 hours, the predicted effect will be seen: the earth trembles, she breaks, and fire and smoke will erupt." Stukeley opposed this predominant explanation - from own observations and accounts of miners he know that there were no chemicals mixtures in the underground as needed for the "explosion hypothesis." He justified his theory also by the fact that: "The underground is generally made of solid rock, perhaps with small fissures. But these fissures are not sufficient to enable vapours to spread under the ground and cause earthquakes. Moreover, there are no mines of sulphur, nitrate or other flammable material in England." Stukeley proposed an alternative explanation: earthquakes occur in hot and dry countries, or after long droughts, when clouds are missing or rare in the sky, and earth becomes charged with electricity. The eventually current then flowing between earth and clouds (here Stukely relates to research of Benjamin Franklin) causes the rumour, similar to a thunder, of an earthquake. This "electric hypothesis" will gather supporters in the following years, especially after the death of Stukeley in 1765. The earthquake 1783 in Calabria will be the beginning of a ferocious debate between supporters of the "explosive hypothesis" and supporters of the "electric hypothesis".